Dr. La Puma’s nationally lauded Chef Clinic® helps businesses and brands who care about energy, well-being and fun! Chef Clinic® Clients have included RealAge, Caremark, GSK, Cigna, Kraft, TEDMED, Harvard, and The World. Chef Clinic® recipes first appeared nationally in Prevention in 1998, and on Oprah! in 1999. Dr. La Puma, together with Cleveland Clinic wellness director Dr. Michael Roizen, taught nutrition, cooking and culinary medicine to medical students at SUNY-Upstate in March 2003, the first such course in the U.S. In 2018, over one-third of U.S. medical schools offer a course in culinary medicine, and ChefMD’s Big Book of Culinary Medicine is used as a text in many. 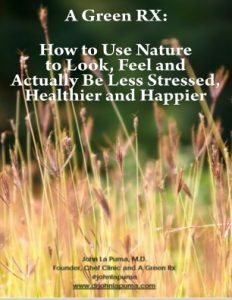 Chef Clinic® makes Dr. La Puma available to others, from small groups visiting Santa Barbara and to large corporations who need the subject matter expert in food as medicine, and nature as medicine. Chef Clinic® has made important contributions to the study of healthy conference meals, physician eating, national trends in physician weight loss medication prescribing habits, physician diet recommendations, and early detection of celiac disease. The Clinic funds this website and its mirrors and Dr. La Puma works on its behalf: its mission is to help people eat, cook and live their personal best, starting today.